The sireline of Saklawi I has been in Poland for a longer time than many realize. 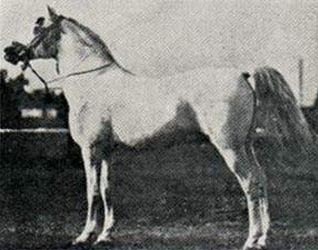 It did not begin with the Aswan sons but with the stallion Kafifan 1916 who was imported in 1924 to Gumniska from Egypt. 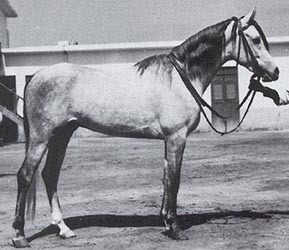 Kafifan's sire, Mabrouk Manial, was a brother to Gamil Manial, the greatgrandsire of Aswan. Kafifan didn't leave much of an impression in Poland as most of his get were either exported or lost in WWII. However, he was a leading sire of racewinners. His son Lartur was used at Babolna and sired Lartur-3 who was imported to Poland but he was only used in warmblood breeding. Kafifan had a full brother that achived more success, Jasir imp to Weil 1930. 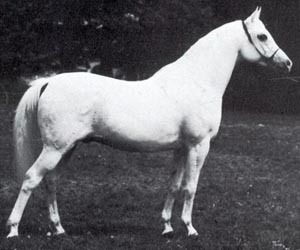 He was the first stallion used at Marbach as he was one of the horses that were transfered from Weil to Marbach in 1932. The truly great influence of the Saklawi I line came when Palas was imported from Russia in 1972. He was by Aswan, the gift horse from Egypt, and out of the Nil daughter Panel which made him three quarter egyptian. Aswan was a gift from the egyptian government to Russia as a "thank you" for the help building the Aswan dam (hence the name change from Raafat to Aswan). The russians were first reluctant to use him as he was incorrect and didn't have any race record to talk about. As he was a gift between states and so that no offence would be given he was bred to a few mares. 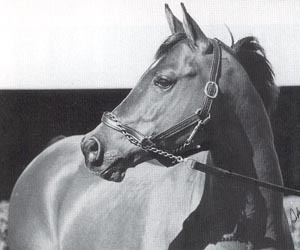 The foals were outstanding and far more correct than their sire and he was permanently installed as chief sire at Tersk. Other Aswan sons were used as well in Poland but not with much success. They were *Magnat imp 1969, *Magnit imp 1973 and Mamluk 1970, leased in 1985 from Sweden. None of these left any sons that bred on. 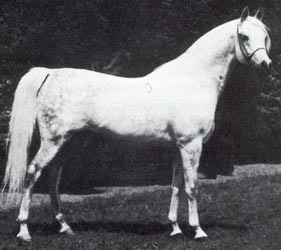 *Magnat was sold to Halberg Arabians in 1969. 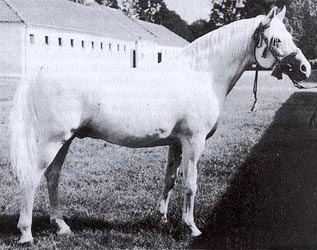 Palas was a tremendous success as a sire and a perfect outcross as he was hardly related to any of the polish mares. His dam line Selma is represented in Poland but it is very scarce and present mainly through the descendants of *Pietuszok who was a full brother to Panel's dam Platina. The other mares of this dam line who were imported are Sardhana 1924 (Nureddin II x Selima, imp 1928 from Crabbet, Zlota Iwa and Rokiczana traces to her), Potencja imp from Russia in 1956 (full sister to *Pietuszok and Platina) and Tiwiriada imp from Russia in 1968 (her dam was maternal sister to *Pietuszok and Platina). Neither one of these branches are large but have left some quality individuals. Palas himself was described by Andrzej Krzysztalowicz: " He had a hollow back, rounded croup, short neck and decent yet not impressive movement. His refined, lean head boasted a very good eye. Generally speaking, he was a very dry horse whose weak hocks were his only deficiency". He sired many sons as well as daughters who has been used all over the world. He combined very well with the Negatiw daughters and this created the polish "golden cross". 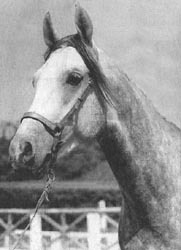 Eight of his sons have been used at stud in Poland, *Gondolier 1974, Ernal 1975, *Haracz 1976, *Endel 1981, Wieden 1982, Ararat 1985, Sennik 1987 and Turban 1988. Palas was exported to Brazil in 1990. He was never raced himself but some of his get have good track records. The stallion Emael 1988 won the Derby, Paragon 1986 won the Criterium and the Palas daughters Pieczec 1976, Empala 1987 and Al-Adha 1989 have won the Oaks. The greatest success for his get have been in the showring. 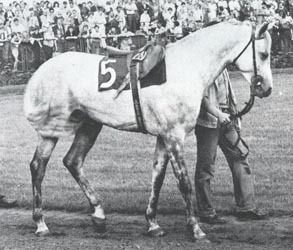 He is the sire of two polish National Champion stallions and one Reserve (*Gondolier, *Haracz and *Endel respectively) and four polish National Champion mares (Etruria 1975, Fantastka 1975, Angola 1976 and Premia 1981). His get have been successful internationally too, for example *Gondolier was the 1982 European and World Champion stallion, *Haracz was the 1985 European and Swedish Champion stallion and Elart was the 1992 European Champion stallion. 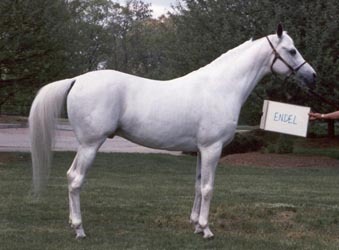 The daughters have been equally successful, Etruria and Pilarka were both World Champion mares and *Penicylina was the 1986 US National Champion mare. *Gondolier was the first son of Palas to be used at stud. Because of his chestnut colour he was used sparingly but three of his daughters were retained. His daughter *Nefretete was exp US but was later imported to Sweden. His sons Pedant exp Belgium and *Czarnolas exp US have been used at stud. *Gondolier himself was exported to US through Sweden. *Haracz was also used sparingly at stud but did leave the pretty chestnut Pens 1984 out of Pentoza, a good racehorse. He left some good offspring in Sweden while on lease (in exchange for Mamluk 1970), among them the stallions *Waracz and Zaracz exp UK. His full brother *Horizjon was imported in utero to US. *Endel was first used at his home stud Michalow and was then on lease to Lasma in USA 1989-1991. He left some valuable mares in Poland and is now owned by Halsdon Arabians in UK. Ernal was used in Poland and was later sold to Britta Fahlgren and Michael Harris, Sweden and UK respectively. 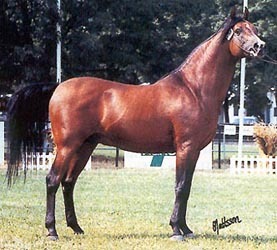 Sennik was used in 1992 but was later gelded. His only daughter has been retained. Turban was first used at his native Kurozweki and then at private studs. Wieden was used by private breeders in Poland and was leased to Sweden in 1988. 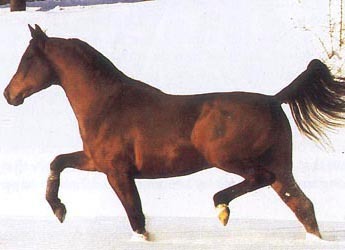 The most successful Palas son in Poland has been Ararat, the 1999 Polish Champion stallion. 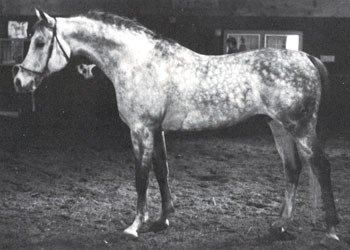 He is an example of the "diamond cross", Palas bred to a *Bandos mare. His dam was a race champion (she won the Derby, the Oaks and the Criterium) but Ararat's record is more modest, 2/17(4-0-2). Among his successful offspring are Emigrant 1991, Extreme 1999 and Eliop 1991. 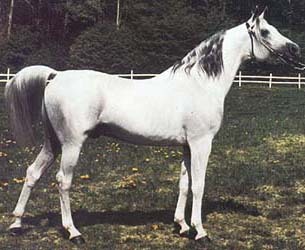 He stod at Vlasakker Arabians in 2003. Emigrant is European Champion stallion, Polish National Champion stallion and All Nations Cup Reserve Champion and has left good offspring, for example the Swedish National Champion stallion Emrod 1997 and Swedish National Junior Champion stallion Margant 2000. 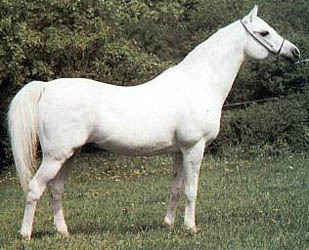 Many Palas sons have been used at stud outside Poland. One of the best known is *Perkal, a US National Top Ten in park and halter. He died prematurely of a heart attack. El Kisch was leased by Slängsboda in Sweden 1986-1988. He was later leased to Italy. Elart is a very good stallion owned by Martenssons Arabians in Mallorca. Among his get is the champion race horse Dart. Festiwal was was sold to Germany and was leased to Sweden for two seasons, 1992 and 1993. 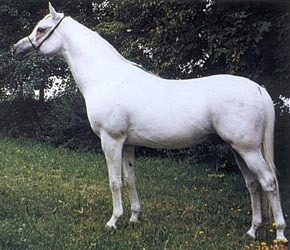 The handsome Palas son Zulus was on lease to France 1985-1988, standing at the government stud Haras de Tarbes. 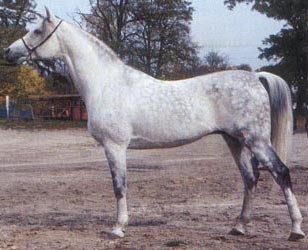 He was sold in the 1989 Polish Prestige sale to Italy. Garwolin, one of Palas best racing offspring, was sold to Holland. 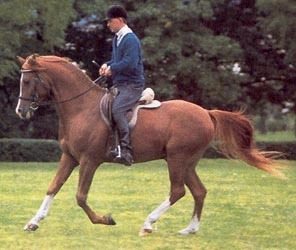 He has been used in warmblood and pony breeding. The Derby-winner *Emael was exported to Town and Country Farms where he stod at stud. He was raced twice in USA, giving him a total record of 5/23(12-3-3)D+8. He was exported to Turkey in 1999. 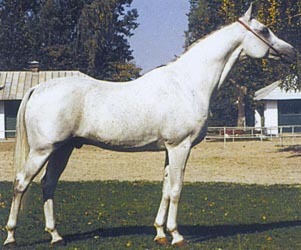 *Andrus was imported in utero by Patterson Arabians. *Lech was also an in utero import. His life changed dramatically when the arabian market collapsed. Changing owners constantly, he was eventually in a bad shape as proper care had disappeared along with the decline in the market. Eventually he was one of the "forgotten" arabians without papers and in poor health (skin and bones with an injured hock). By chance Nancy Ryan discovered him and nursed him back to health. With help from the Registry she was able to get his papers and he is now a breeding stallion. The Saklawi I line is important as it provides an excellent outcross to the polish mares while adding type. The conformation faults some of the progenitors of this line had can be avoided if careful selection of the mares is done. It has even given athletes, for example *Perkal and *Emael, when bred to the proper mares.